Garba Shehu, Abuja: President Muhammadu Buhari on Friday in Abuja called on African leaders to form a strong united front to defeat terrorism and violent extremism, which is inhibiting development in Africa. Receiving Kenya’s Deputy President William Ruto at the State House, President Buhari expressed concern that the continent is still grappling with acts and effects of terrorism inhibiting development in Africa after a successful decolonisation campaign. 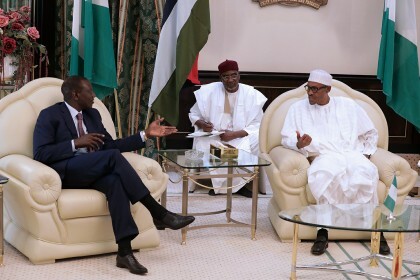 Acknowledging the valued cooperation between Nigeria and Kenya in the fight against terrorism, the President commended the East African country for the recent successes recorded in tackling terrorism in the region. “A situation in which insecurity continues to obstruct the process of national development should not be allowed to continue”, the President told Mr. Ruto, a special envoy to President Uhuru Kenyatta. On the forthcoming election of a new leadership for the African Union Commission (AUC), President Buhari said African States needs a very strong leadership at the AUC that will encourage member states to refocus their resources and energy toward human and national development. On Kenya’s request for Nigeria’s support for the candidature of Amb. Amina Mohammed, Kenya’s Foreign Minister, who is vying for the AUC Chairperson, President Buhari said Nigeria will hold robust consultations with other African leaders on the need for strong and capable leadership that will respond to the current challenges facing the continent. In his remarks, Deputy President Ruto commended President Buhari for his leadership, particularly on regional security and the fight against corruption. Ruto said President Buhari’s effort to eradicate terrorism and violent extremism had emboldened the continent’s resolve to achieve lasting peace and security.